Karen Jimenez graduated with a BA in Theatre Management from the University of Texas in Arlington. Upon graduation, she moved to Southern California, where she spent six years working on various film and television series as an assistant production coordinator. Always intrigued by storytelling, in 2002 she started her exploration into the impacts that cultures have on stories. She spent two years as a Peace Corps volunteer in Gabon, West Africa and one year as an AmeriCorps VISTA volunteer in Southeast Alaska. In 2006, while earning her Masters in Nonprofit Management at the New School, she began serving as the Theatre Operations Assistant at the New Victory Theatre in Times Square. 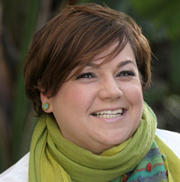 She returned to Southern California in 2008 where she soon joined the classified staff of Irvine Valley College as the interim Box Office and Front of House Manager for the Performing Arts Center. Two years later, she became permanent full time as the Performing Arts Center’s Operations Manager. She has served on the IVC Classified Senate as Secretary and just started her first term as President-Elect. She had the honor of presenting a successful breakout session at last year’s CLI in Sacramento and looks forward to presenting again this year. She is excited about getting to know and support fellow classified employees throughout the state!